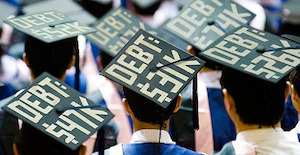 It is no secret that students are funding their college educations with more and more loans. The total outstanding student loan debt has reached $1.2 trillion, 93 percent in the form of federal student loans and the remainder from private lenders. Students of all races and ethnicities are taking out loans, but a larger percentage of Black undergraduates took out students loans than any other demographic group in 2011-12, according to a Wells Fargo report. Johnny C. Taylor, president of the Thurgood Marshall College Fund (TMCF), said that he attributes the large number of Black students taking out loans to their parents’ financial stability or lack thereof. Reasoning that adults between the ages of 35 to 44 would be the most likely to have college-age children, he cited the national unemployment statistics for that demographic. Overall, 4 percent are unemployed, but 7.1 percent of African-Americans between the ages of 35 to 44 are unemployed. With higher unemployment rates, parents would be unlikely to be in a position to help their children pay for college, leading the children to take out loans. “What that means then is that the only way current enrolled African-American students are going to get to school is relying on student loans,” Taylor said in a press call. The days when students could work through a four-year college and pay their own way are long gone. The typical minimum wage job a college student might expect to get would more realistically cover the cost of books and some living expenses, not tuition and fees. And while the average American family might diligently put aside money for their children’s education, with a median income of $52,000, the majority cannot be expected to foot the full bill, even for one child. As a result, students of all races are increasingly dependent on student loans. At some private four-year colleges, after all, the full price of one year of college is approximately $50,000 to $60,000. That number is not expected to go down any time soon. According to the Wells Fargo report, Black students who enrolled at a four-year college in 2011-12 could be expected to borrow $28,400, and Hispanic students $27,600 over the course of their undergraduate career. Rasmussen said that today’s typical consumer sees the value in taking out $25,000 in debt to fund their undergraduate degree. There is greater trepidation among parents of preschoolers, he said, who are concerned about the large amounts they will have to save to help their children pay for college down the line. When the nation’s total student loan debt hit $1 trillion in 2012, the Consumer Financial Protection Bureau famously compared the situation to the subprime mortgage market prior to the housing bubble burst, sparking fears that unpaid student loans might cause a similar financial disaster. Taylor and Wells Fargo employees cautioned consumers to not be swayed by doomsday scenarios. A college degree is still worth the gamble, said Eugenio Alemán, a Wells Fargo director and senior economist. “Whenever you graduate from college, your potential income over your lifespan is much higher than if you don’t graduate from college,” he said. Alemán said that the negative effects of taking out debt to pay for an undergraduate education are “relatively benign.” Indebted graduates are more likely to delay buying homes, cars, getting married and starting families due to their financial circumstances. Taylor said he worried that such reports would scare students away, particularly from low-income communities, when those students would benefit from getting an undergraduate degree.